Abel Ximenes, Quarantine Plant Pathologist and Joaquim Sarmento Cabral, Quarantine Entomologist at the National Directorate for Quarantine and Biosecurity (DNQB), Timor Leste Ministry of Agriculture and Fisheries came to Australia to learn new skills and transfer their expertise in plant biosecurity, quarantine, plant pathology, entomology and molecular biology to fellow workers in DNQB and other institutions in East Timor. “The training provided in Australia to us will assist East Timor to mitigate plant quarantine risks and will also support and strengthen sustainable food production, leading to increased food security for East Timor,” they explained in their written report of their training. 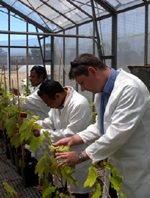 Abel and Joaquim learn how to screen grapevines within the DAFWA PEQ glasshouse for the presence of exotic diseases such as Grapevine fanleaf virus and Phomopsis viticola. Working together the Commonwealth Department of Agriculture Fisheries and Forestry (DAFF) and the Department of Agriculture and Food, Western Australia (DAFWA), they received 8 weeks of training in Darwin and Perth. 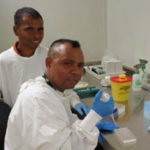 “Timor Leste and Australian communities, economies and environments benefit significantly from biosecurity systems that reduce the risk of unwanted pests, weeds and diseases entering and establishing,” they noted. Their training programme included general and applied plant biosecurity, plant quarantine, pest and disease identification and a two week English course. DNA extraction techniques with DAFF molecular biologist Vera Andjic in the Perth Laboratory. “Training with entomologists and plant pathologists included processing and identifying pathology and entomology samples in the laboratory. Abel and Joaquim also accompanied officers into the field to inspect cargo and live plants undergoing Post Entry Quarantine, and to collect pathology and entomology samples and submit these for identification. The training included an overview of passenger and fresh commodities quarantine inspections from both state and commonwealth perspective, and training in incident management and response strategies. They learned about how to lodge specimens and about maintaining herbarium and culture collections. Visiting East Timorese scientists Joaquim Cabral and Abel Ximenes receiving training certificates from Drs Darryl Hardie and Vincent Lanoiselet (Department of Agriculture and Food) and Dr Aaron Maxwell (Commonwealth Department of Agriculture Fisheries and Forestry). “We both think that the training provided by AQIS and DAFWA was very valuable. Our English skills have greatly improved thanks to the two weeks with Navitas in Darwin and also because we had to practice this language on a daily basis at work and also outside work during our eight week stay in Australia.” said Mr Ximenes. “This training will enable East Timor to safeguard its food production system from biosecurity risks. There are mutual benefits – strengthening biosecurity in East Timor safeguards Australian agriculture and environment as well,” said Dr Sharma, Director Plant Biosecurity, DAFWA.